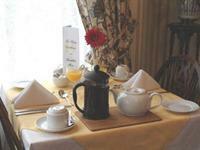 Breakfast is served between 8:30 and 9:30am, at separate tables, in the bright and sunny ground floor breakfast room. 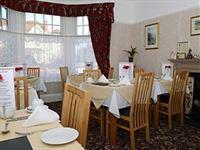 It is cooked to order using fair trade and locally sourced organic products where possible. 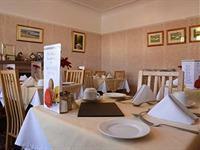 Under exceptional circumstances breakfast can be available from 8am. So whether you want a full cooked breakfast, kippers, salmon and scrambled eggs, fruit salad and yogurt or something more continental then you can rest assured that it is going to be good. We also cater for special diets or anything else you might fancy - just let us know when booking. Coffee: Ground, Instant or Decaf. Two Rashers of Back Bacon, Traditional Recipe Sausage (gold award winning!! 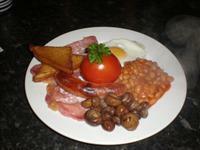 ), Roasted Tomato, Free Range Egg (Fried, scrambled or Poached), Mushrooms, Baked Beans, and Fried Bread. A vegetarian version or vegan breakfast is also available. Or, if you prefer, a combination of any of the above with fried, scrambled or poached egg. Or if you fancy something lighter there's kippers, porridge, salmon and scrambled eggs and we usually have a selection of welsh cakes, croissants, pastries and crumpets available too.